The DeLonghi EC155 Espresso and Cappuccino Maker is one of Amazon’s best sellers bar pump espresso maker. It’s a 15-bar pump espresso machine that is inexpensive, but loaded with features. You can throw in an espresso pod with the one or two shot serving and brew almost anything with the two-in-one filter. With this machine, you can brew espressos, cappuccinos and lattes efficiently. However, there are some things you should know about the product before diving in. It has a 35-ounce removable water tank that can be easily filled. An indicator light also lets you know when the water level is too low. The display or control panel is clearly visible and features only a few, easy-to-operate dials. A dual filter means you can brew using espresso pods or loose coffee grounds. It features an easy to clean removable drip tray that can be used to store pods. You can control the temperature of the steam and water separately through the use of dual thermostats. This means the temperature of your drinks will be perfect every time. The DeLonghi EC155 is compact so it doesn’t take up much counter space. A swivel jet frother means lattes and cappuccinos are easy to make even for beginners. The built-in tamper makes it even easier to make beverages. There’s a self-priming function that eliminates the need to prep before the machine starts up. The price and functionality of the machine make it a worthwhile investment. It’s difficult to use a tall cup because there are only 2.5 inches of clearance between the spout and the drip tray. The built-in tamper doesn’t do a thorough job, so a dual tamper may be needed. It creates a lot of froth, which makes it messier than other espresso makers. If the filter is twisted too tightly, then it might get stuck. This will make your machine useless until you can have it repaired. This espresso and cappuccino maker is highly-rated with pros that far outweigh the cons. Features galore gives it quality, convenience, and control. And the low price makes it a product that offers a lot bang for a few bucks. 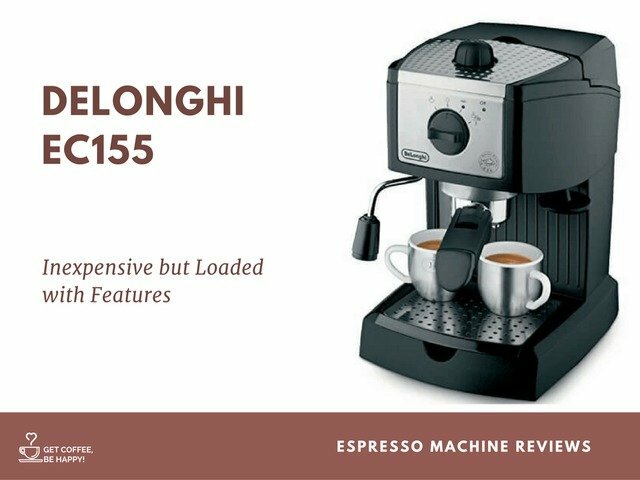 The DeLonghi EC155 it’s best suited for first time cappuccino and espresso makers who might be looking for a change from the instant or drip coffee machines. 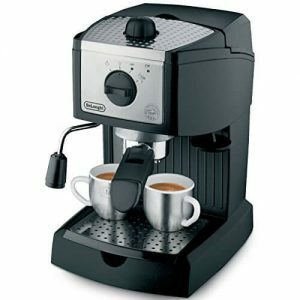 The DeLonghi is a small, durable 15-bar pump espresso and cappuccino maker that has the capacity to make a lot of tasty coffee drinks. The stainless steel boiler and two thermostats keep the steam and the water at the right temperature all of the time. Espresso grounds or E.S.E. pods can be used with the dual filter holder to make a refreshing espresso. However, if you’re more of a cappuccino person, then the rotating and easy-to-use frother can help with that. Alternatively, latte lovers will enjoy making their drinks with the jet frother powered by 1,100 Watts of energy. However, the features don’t stop there. There’s also a self-primer, a 35 oz. water tank, a removable drip tray, a 15-bar pump, and it’s easy to use. The brewing properties of this machine are one of it’s biggest selling points. It can consistently make espresso shots with crema. Generally, it can make 1 to 2 cups with the built-in tamper and an additional tamper of at least 50 millimeters. The machine preheats in 15 minutes, warms up for brewing in 1 minute and 45 seconds, and steams for 42 seconds. After preheating, all you have to do is attach the tamped and filled filter then brew when you see the green light turn on. Once the cup is filled, all you have to do is stop the brewing cycle manually. The 2.5 inches of clearance from the drip tray to the spout is perfect for shot espresso glasses or cups. 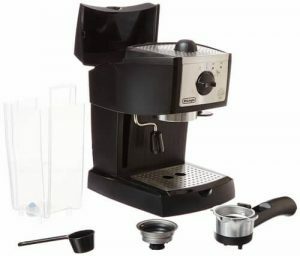 There are many features offered by this espresso and cappuccino maker, but the most notable ones are the self-primer, dual thermostats, rotating jet frother, and the dual-functioning filter holder. Self-primer: This feature prevents the need for pre-brewing preparation. Dual Thermostats: There are two thermostats for the two filter holders. With this feature, the temperature can be set, changed and monitored easily. You can brew both a warm cappuccino and hot espresso at the same time. Rotating or Swiveling Jet Frother: Because the frother wand can be swiveled around, you’ll get an even amount of froth that is also thick and rich. The jet characteristic of the frother also gives it more power. Dual Filter Holders: This filter holder gives you the freedom to use ground espresso or espresso pods. The water tank holds 35 ounces, which means you can make 8 to 10 shots with your tamped grounds or pods. It’s rare to find a pump driven espresso and cappuccino maker for under $100. The DeLonghi EC155 is not only pump driven, it also has many features that make it a smart investment. The disadvantages are easy fixes and don’t take away much from the machine’s power or convenience. For example, buying an inexpensive tamper will easily solve the problem found with the sometimes inefficient built-in tamper. 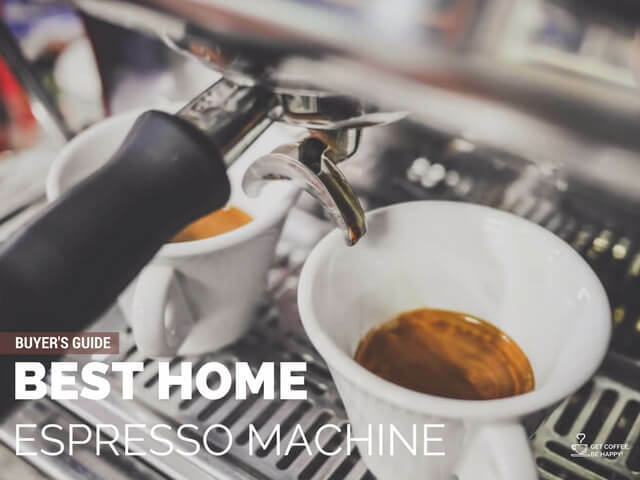 This is the machine for a novice or a casual espresso maker because it’s easy to use, easy to clean and incredibly affordable.